Ruta Solidaria Ford emerged as an evolution of the “8 Rutas de Fiesta” project, which highlighted the island’s beauty along routes planned by the “Ruteando mi Isla” tourism social platform. As part of its commitment to contribute to the recovery of the island, the Ford office for Puerto Rico, Central America and the Caribbean carried out the first event of its “Ruta Solidaria Ford” in the Buenos Aires community of Arecibo, where the Río Grande river covered streets and homes with mud, causing great losses. During this event, non-perishable food, water, flashlights, first aid kits, wipes and hand sanitizers were delivered to around 500 families. The American Red Cross, which worked with Ford to deliver the items, received a $150,000 donation from Ford to continue its recovery efforts around the island. Attendees also enjoyed the music of Pedro Capó, who joined the group of volunteers to distribute supplies, along with the Sony Music team. Starbucks, Suiza Dairy and Malta India, which provided refreshments, as well as the Instituto de Banca, Fundación El Plato Caliente, Chef Nayarit Luciano, Subway and Faccio Pizza, which provided hot food to attendees joined the event. Also joining the Ruta Solidaria Ford were Ruteando mi Isla, Puerto Rico Vector Control, Centro Cristiano de Alabanza, CETI College, Mazola, Ciclón, Xperts Team, Mujer Emprende PR, Burson-Marsteller, Stereograph, Historias de Camino, Borinqueando, La Entrevista de Greta, Alex Díaz, Glory Racing and Daniel el Travieso. “We hope that Puerto Rico can overcome this difficult experience as soon as possible. 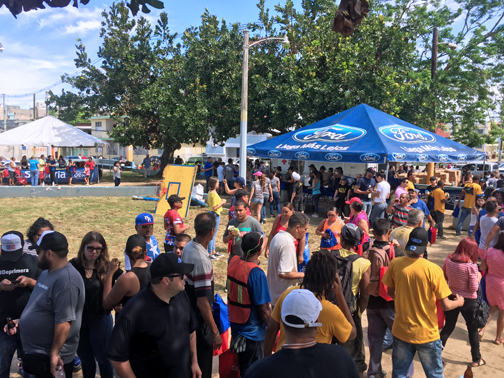 The ‘Ruta Solidaria Ford’ is part of what we are doing to contribute to the island’s recovery,” said Vivian Dávila, public affairs and communications manager for Ford Puerto Rico, Central America and the Caribbean. Hey Buddy!, I found this information for you: "‘Ruta Solidaria Ford’ starts with event in Arecibo". Here is the website link: https://newsismybusiness.com/solidaria-starts-arecibo/. Thank you.